His dedication and passion for doing what’s right for his clients has made him a top financial advisor in the industry. Congratulations! The Financial Times 400 Top Financial Advisors is an independent listing produced annually by the Financial Times (April 2019). The FT 400 is based on data gathered from advisors, broker-dealer home offices, regulatory disclosures, and the FT’s research. The listing reflects each advisor’s status in six primary areas: assets under management (AUM), asset growth, compliance record, experience, credentials and online accessibility. This award does not evaluate the quality of services provided to clients and is not indicative of this advisor’s future performance. Neither the brokerages nor the advisors pay a fee to the Financial Times in exchange for inclusion in the FT 400. Barron’s logo reprinted with permission of Barron’s. 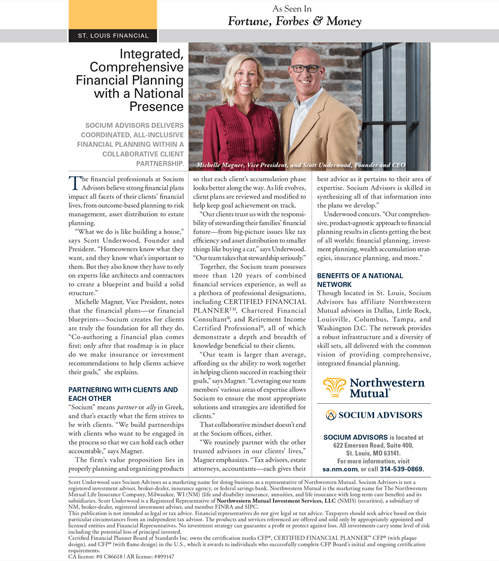 Socium Advisors delivers coordinated, all-inclusive financial planning within a collaborative client partnership. Read the article. Herbert Valentine Kelly III, Scott Preston Underwood and Michelle L Magner use Socium Advisors as a marketing name for doing business as representatives of Northwestern Mutual. Socium Advisors is not a registered investment adviser, broker-dealer, insurance agency or federal savings bank. Northwestern Mutual is the marketing name for The Northwestern Mutual Life Insurance Company, Milwaukee, WI (NM) (life and disability insurance, annuities, and life insurance with long-term care benefits) and its subsidiaries. Herbert Valentine Kelly III, Scott Preston Underwood and Michelle L Magner are Representatives of Northwestern Mutual Wealth Management Company® (NMWMC), Milwaukee, WI (fiduciary and fee-based financial planning services), a subsidiary of NM and limited purpose federal savings bank. All NMWMC products and services are offered only by properly credentialed Representatives who operate from agency offices of NMWMC. Herbert Valentine Kelly III and Scott Preston Underwood are Agents of Northwestern Long Term Care Insurance Company, Milwaukee, WI, (long-term care insurance) a subsidiary of NM. Herbert Valentine Kelly III, Scott Preston Underwood and Michelle L Magner are Registered Representatives of Northwestern Mutual Investment Services, LLC (NMIS) (securities), a subsidiary of NM, registered investment adviser, broker-dealer and member FINRA (finra.org) and SIPC (sipc.org). Herbert Valentine Kelly III, Scott Preston Underwood and Michelle L Magner are Insurance Agents of NM. Herbert Valentine Kelly III is primarily licensed in VA and may be licensed in other states. Scott Preston Underwood and Michelle L Magner are primarily licensed in MO and may be licensed in other states.